The pioneers of British Rhythm and Blues music will perform in Skegness this weekend. Maximum R ‘n’ B with The Manfreds will be at the Embassy Theatre, in Skegness, next Friday, October 19. Original Manfred Mann members Paul Jones, Mike d’Abo, Mike Hugg and Tom McGuinness are joined by Rob Townsend, Marcus Cliffe and Simon Currie as the exciting new line-up of The Manfreds. Since forming in 1962, Manfred Mann have secured their place in the history of British pop music. The band is known for hits including Do Wah Diddy, Pretty Flamingo, Sha La La and 5-4-3-2-1. The Manfreds re-formed in 1991 and have been in constant demand ever since. 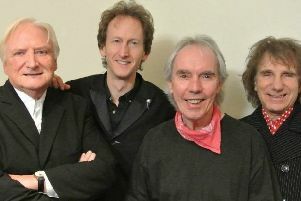 As well as performing their most loved songs, the 60s band will also perform tracks that brought them success as individual artists. These include Handbags and Gladrags by Mike d’Abo and When I’m Dead and Gone by Tom McGuinness. For 2018, the Maximum R ‘n’ B tour will also include a guest appearance from Georgie Fame. As the founding member of Georgie Fame & the Blue Flames, the band became famous for their three number one singles - Yeh Yeh, Get Away and The Ballad of Bonnie and Clyde. Or you can also call the Embassy Theatre box office on 01507 613100.